“Did you catch the Stallions ”“ Hound Dogs game”? “Who do you think the Bombers will draft”? “Boy it’s great to have Professional Football back in the Spring”. “Do you think a U.S. market team will capture another Grey Cup?” Recognize these conversations? Likely not unless we could turn back the clock, and change the outcome of decisions made about 25 years ago. This article reveals some examples of Professional Football teams that never materialized. Let’s start with the ”˜big’ league. In May of 1992 the NFL announced five finalists of which two would become the NFL’s 29th and 30th franchises. As we know, Carolina and Jacksonville would get the ”˜vote’ and begin play in 1995. The following provides some background, and a ”˜graphic glimpse’ of the three teams that ”˜never took the field’. One of the hopeful cities included St. Louis. Void of professional football since the departure of the Cardinals, (final game played in 1987 season) the city appeared to be a prime candidate for expansion. Believed to be a favorite, St. Louis did not make the cut. According to a NY Times report, one of the factors leading to the decision was the fear of an earlier investment group reemerging. The NFL sensed possible litigation from this ”˜former’ group if the franchise had been awarded to a ”˜new’ group of investors. After the disappointing announcement, a glimmer of hope remained for the ”˜Gateway City’. Former New England Patriot owner James Busch Orthwein (member of the Anheuser-Busch family) looked to relocate the Patriots after the 1993 season to his native St. Louis. As with the attempted expansion franchise, the nickname was to remain the ”˜Stallions’. Fortunate for the New England faithful, the attempt to relocate failed. Weeks of negotiations between Orthwein and Kraft included an offer of $75 million to buy out the remaining lease with Foxboro. The two eventually reached a deal (some refer to it more as a hostile takeover) ending with Kraft purchasing the Patriots for a then-record $172 million. Following are graphics and actual photos of the proposed helmets, logos, and uniforms of the Stallions. I’m not exactly clear if the design was introduced prior to the time of entry, Orthwein’s creation, or a design that remained status quo throughout its short life. The five 1992 finalists included another former NFL city entry. The city of Baltimore, who had lost their beloved Colts in 1983, appeared to be another prime candidate for expansion. Names for the entry included an attempt to buy back the original Colts. Robert Irsay’s (Colts owner) refusal to sell the name forced the group to contemplate other nicknames. Considerations included the Rhinos and Ravens; yes, Ravens. Although Ravens was favored in a Baltimore Sun poll, ownership feared their subsequent design might be too close to the black wing insignia of the Atlanta Falcons. The ownership ultimately decided on the Bombers in honor of the B-26 Marauder WWII bomber aircraft. Baltimore was home for the Glenn L. Martin Company, designer and producer of the B-26. As with St. Louis, another predicted favorite failed to get the vote. According to Wikipedia, league commissioner Paul Tagliabue opposed any expansion to Baltimore, saying “some towns are football towns and some towns are museum towns. I guess Baltimore is a museum town”. Adding to the decision, other reports considered Washington Redskin ownership may have been lobbying quietly against Baltimore given the proximity of the two cities. The football ”˜cavity’ was eventually filled in 1994 by the CFL’s brief expansion into the States (1993 thru 1995). Motivated by fan antipathy towards the NFL, the Baltimore Stallions (previously known as the CFL Colts), led the CFL in fan attendance in 1994, and second best in 1995. Following are graphics and ”˜ball cap’ photo of the Baltimore Bombers. To complement the blue and white, a unique bronze was included in the team’s official colors. Rounding the five finalists was the city of Memphis. Although this would be new grounds for the NFL, big NFL names had previously left their ”˜cleat marks’ in Memphis with other professional football leagues. The list included Larry Csonka, Jim Kiick, and Mercury Morris (former Dolphin trio joining the WFL’s Memphis Southmen/ Grizzlies), and Reggie White with the USFL’s Memphis Showboats. The investment group was led by cotton magnate William Dunavant. Fittingly, after Elvis Presley Enterprises joined the investment group, it was decided to name the team the Hound Dogs. Presley Enterprise spokesman Todd Morgan quoted “it will be rough and tough just like Elvis”. Part of the decision to eliminate Memphis appeared to be connected to their home stadium. The Hound Dogs were scheduled ”˜to follow the tracks’ of the former WFL and USFL tenants in the aging Liberty Bowl. Like Baltimore, the CFL awarded a US market team in Memphis. With declining attendance, The Memphis Mad Dogs would only last a single season. Following are graphics and photos of the proposed Hound Dogs team. Although the final team colors appear to be gold, black, and teal, the ”˜placement’ of the colors remained unclear (i.e. alternate helmet colors, etc). Unsuccessful attempts to ”˜field a team’ were not limited to the NFL. Following mention of the short-lived CFL US expansion teams in Baltimore and Memphis, I felt compelled to include the proposed path of the CFL in the US market. Slated to begin play in 1996, the Miami Manatees were scheduled to host games in the Orange Bowl of Miami. Planned to be an expansion franchise, the ownership group refocused their attention on relocating the defunct CFL Las Vegas Posse. Purchasing the existing franchise proved to be a significant savings to an expansion fee ($1.45M vs. $3M). 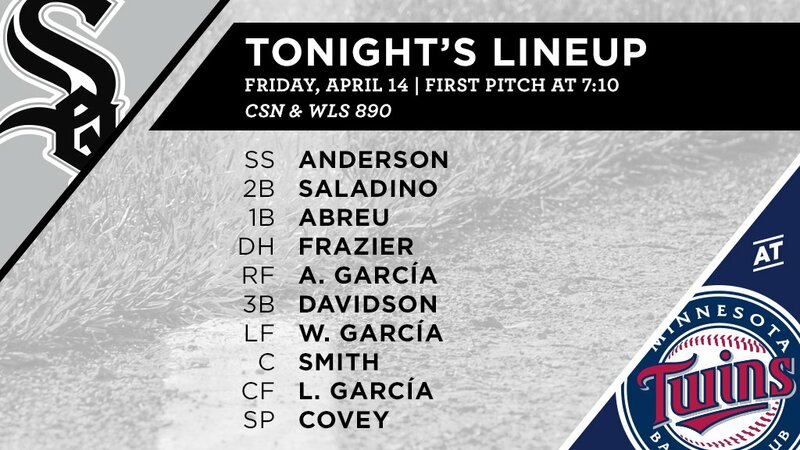 Of note, the team adopted a manatee named Gamzo, and portions of the ticket sales were intended to help fund Florida’s endangered manatees. In the spring of 1996 the CFL suspended all of its U.S. operations. As a result, the Manatees never came to fruition. Although the Manatees never took the field, Miami locals did get a brief encounter of the CFL with an exhibition game played at the Orange Bowl between the Baltimore Stallions and Birmingham Barracudas. Following are graphics of the proposed helmet and uniforms. As you’d expect, orange is one of the prominent colors. This final inclusion summarizes the futile plight of an entire league. Seemingly to fill the ”˜spring football void’ the USFL vacated in 1985, the PSFL emerged. Scheduled to begin play in the Spring of 1992 (February 29 to be exact), the Professional Spring Football League joins my search of pro football’s teams that never ”˜took the field’. For this example we need to clarify that ”˜took the field’ implies actual game-day. Not only were practice fields active, but a few exhibition games were played. The PSFL ceased operations on February 19, 1992, just 10 days before the season opener. According to Wikipedia, “this league probably got the closest to actually starting the season than any other example”. Not only were training camps active, rosters had already been trimmed down to 60. Notable roster ”˜survivors’ included former Washington Redskin, Tim Smith who was in camp with the New Mexico Rattlesnakes. Smith is best remembered for his record setting 204 yards rushing against Denver in Super Bowl XXII. Joining Smith was AFL Hall of Fame wide receiver George LaFrance. LaFrance spent several seasons with both the Detroit Drive and Tampa Bay Storm and became the only player to win ArenaBowl MVP 3 times. Notables destined for the New England Blitz lineup included Bernie Parmalee (former Dolphin RB), Tony Rice (former Notre Dame QB), and Arena Football ”˜iron-man’ great Barry Wagner. West Virginia University Heisman candidate Major Harris, and AFL Hall of Fame defensive standout Durwood Roquemore were slated to don the silver, royal blue, and black of the Washington Marauders. The PSFL could have provided family reunion venues for the Zendajas’. ”˜Zendajas’ appeared on three kicking roster spots; Luis with the Arkansas Miners, brother Max onboard with the New Mexico Rattlesnakes, and cousin Martin “Marty” providing the leg for the Oregon Lightning Bolts. My ”˜on the field’ roster research concludes with the USFL’s sack leader John Corker. Corker recorded 28.5 sacks with the Michigan Panthers in 1983. That effort earned him USFL Defensive Player of the Year. Corker was scheduled to continue his ”˜Spring-season’ experience with the Arkansas Miners. The PSFL would have also provided positions for a few off-the-field NFL noteworthy alumni. North Carolina native Roman Gabriel would have stayed ”˜close to home’ as the GM for the Carolina Cougars. One may recall Gabriel’s post playing years as offensive coordinator with the USFL’s Boston Breakers and Arizona Wranglers, and head coach with the Raleigh-Durham Skyhawks of the WLAF. Former Patriot QB Steve Grogan would have returned to familiar settings filling the head coaching position with the New England Blitz. Grogan spent his entire sixteen season career with the Patriots and later inducted into the New England Patriots Hall of Fame. Former NFL QB Craig Morton was also scheduled to join the coaching ranks in the new league. Morton, former Cowboy, Giant, and Bronco, was to assume the head coaching role with the Oregon Lightning Bolts. My ”˜off the field’ research concludes with Boyd Dowler. Dowler played twelve seasons with the Green Bay Packers holding two positions as wide receiver and punter. His elite career earned him both NFL Rookie of the Year in 1959, and Packers Hall of Fame induction. After retiring, Dowler served as a longtime assistant coach with the LA Rams, Washington Redskins, Philadelphia Eagles, Cincinnati Bengals, and Tampa Bay Buccaneers. Dowler was slated to take his experience to the Tampa Bay Outlaws as their new head coach. Following are helmet logos of the ten-team league. I ”˜assume’ some actual game helmets may be out there? Quite a collector piece! I hope the readers enjoyed this article as much as I enjoyed writing and researching the subject. I’m sure there are teams and leagues I missed; i.e. Baltimore/ Virginia/ Washington Ambassadors of the WFL who eventually landed in Orlando as the Florida Blazers, and, the Toronto ”˜Northmen’ (also of the WFL) who would ultimately find their home in Memphis as the ”˜Southmen’. Figure: Toronto Northmen logo; courtesy Pinterest. Phil here. Thanks, John! Terrific research and you have some wonderful personal effects from teams who never really were. Great stuff! Hard call, Phil. But I am with you — I wouldn’t use the criteria the Ray used. To me, the perfect baseball card just looks good. Good framing. Good picture. That’s all that matters. It’s just beautiful all around. Topps could learn about from themselves just looking at that card. BTW – thanks for all you do, Phil. Take care! I received a bunch of submissions from you guys already, and I’ll continue to run them — if you’d like to send me your “perfect” card, my e-mail address is above. 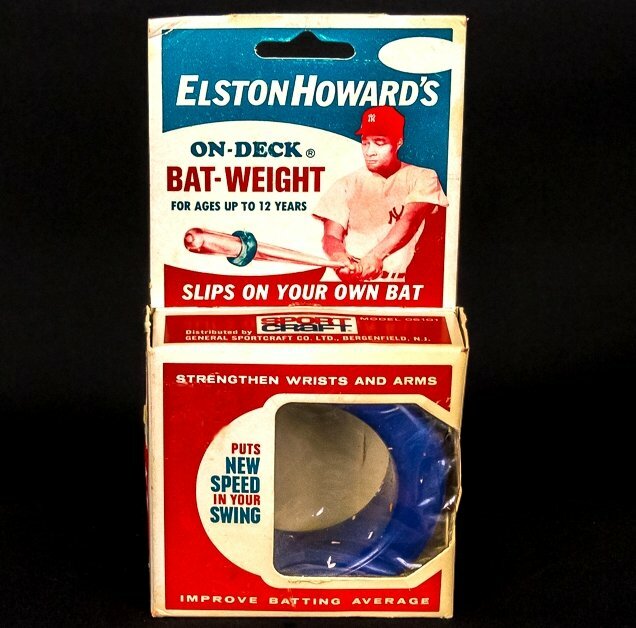 Baseball News: Elston Howard, who became the 1st African American to play for the Yankees on April 14th in 1955, was also the creator of the batting donut (from Bruce Menard). … Cleveland’s Jason Kipnis is apparently very picky about his shinguard (from Dan Gartland). 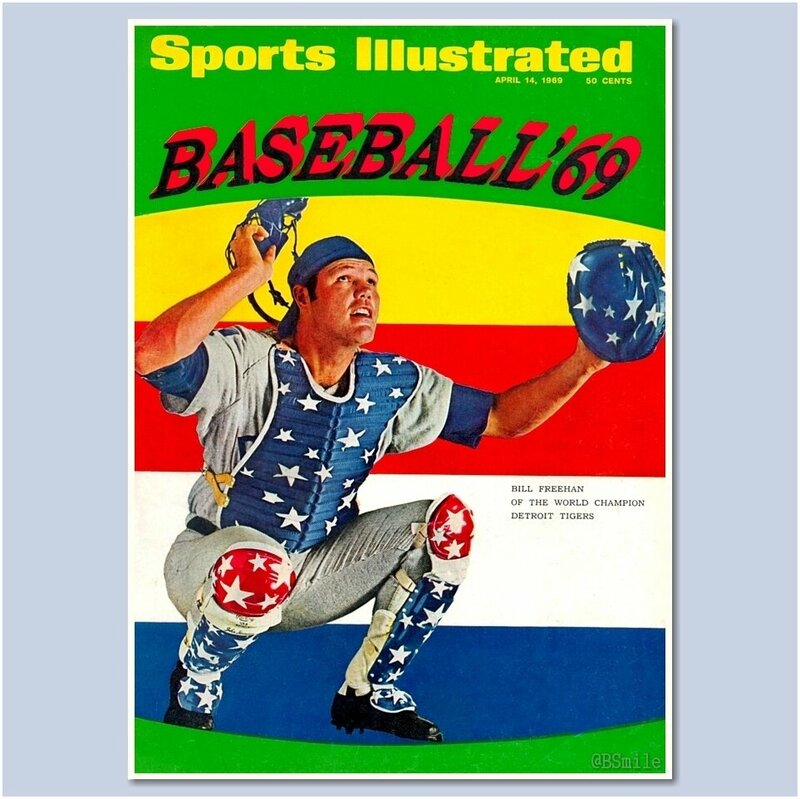 … Before there was flag desecration gear — there was flag desecration gear (that’s Bill Freehan of the 1968 World Champion Detroit Tiger). From Bruce again. … Yesterday was Super Hero Night for the Daytona Tortugas (from Daytona Tortugas). … “Have you ever seen CoolFlow ice cream helmets?” asks Adam Korengold. Can’t say that I have. 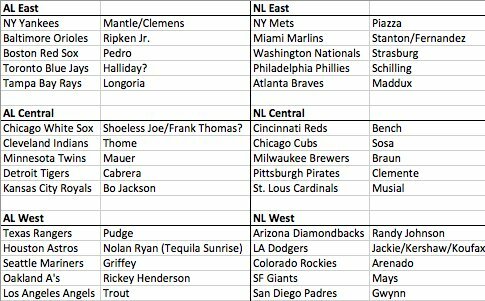 … Interesting thought here: “If you had to buy a jersey of one player (all time) for every MLB team, who would you choose?” asks Ty Tamlin. “These are my picks.” The resulting comments on his choices are pointed. Here are the choices of J. Daniel. 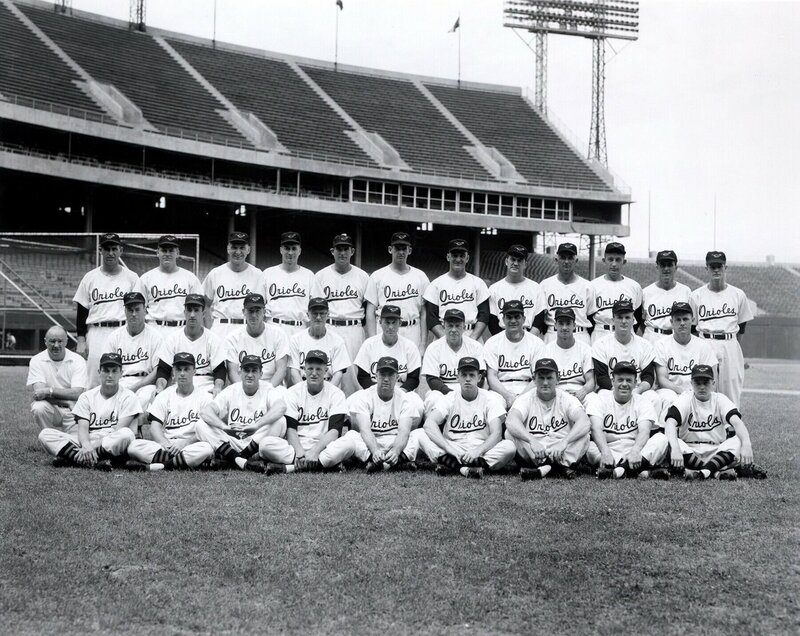 … Here’s a great photo of the ‘original’ Baltimore Orioles from 1954 (h/t Mark Johnson). 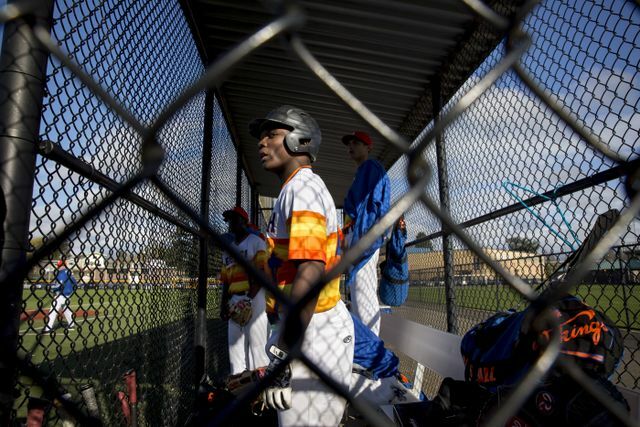 … Rainier Beach (Seattle) High School wears Houston Astros “Tequila Sunrise” unis. Submitter Jay Danbom adds, “Interesting use of the space needle instead of the Star. Also mimicked on the hat like the astros hat. Also a great article on how the team has risen from being the laughing stock of the league to respectable.” … In a project that took two years to prepare, the Major League Baseball Association worked with Austin-based LatinWorks to launch “Ponle Acento” (“Put an Accent on It”), which got Major League Baseball to put Spanish accents on player jerseys (from Jenks McGee). … Tweeter MattyMode recently performed a New Era de-logofication on his new Red Sawx cap. … Just because we’ve probably never seen these in a UW ticker before, here are the uniforms of the Chico State Wildcats, the alma mater of Travis Souders. 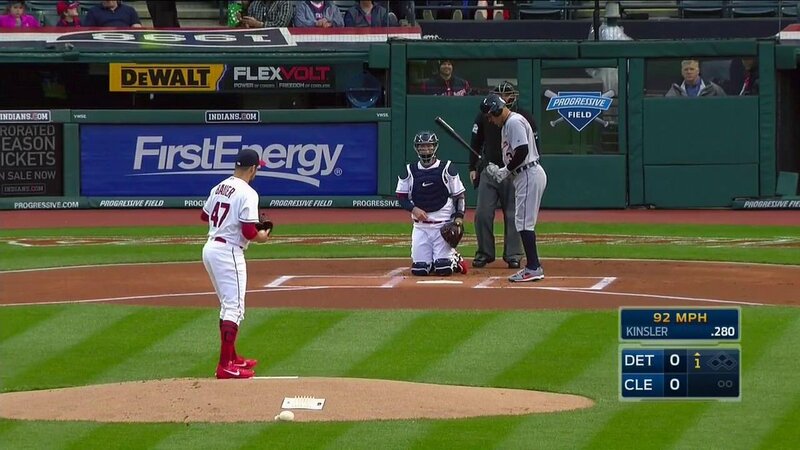 … Last night, the Indians Trevor Bauer was wearing Stance Block C socks (from Robert Hayes). 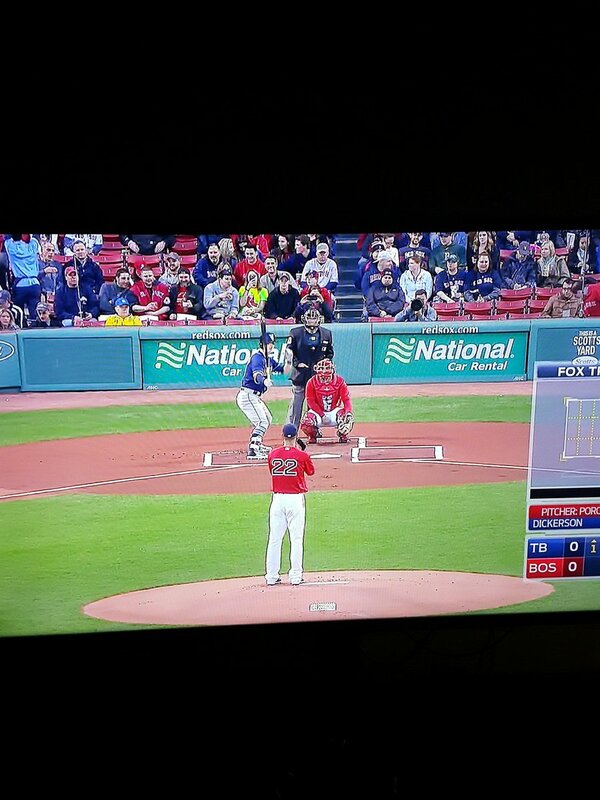 … Friday Night at the Fens produced a color vs. color matchup for the Sawx and Rays (from Tory Thompson). 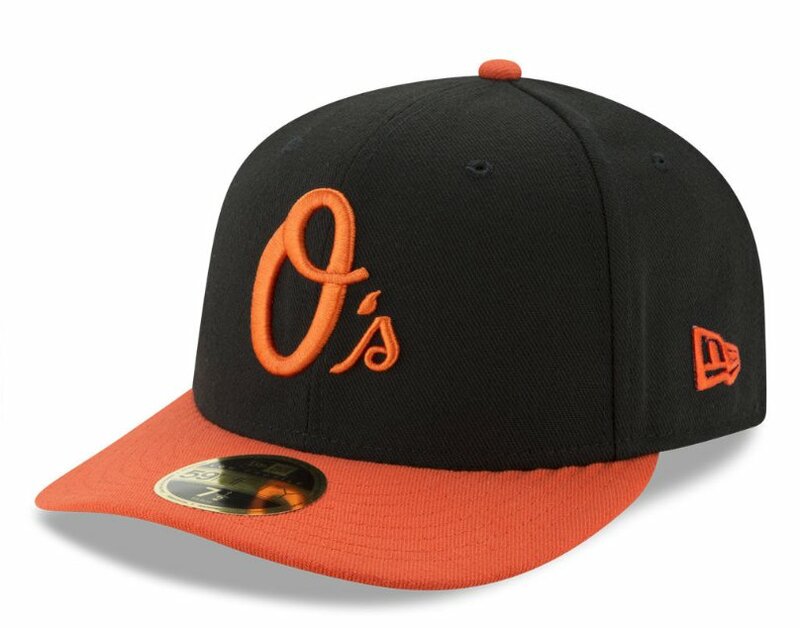 … This article suggest a few modest uni proposals for the AL East, including one of Uni Watch’s biggest gripes: fixing the Orioles apostrophe catastrophe (thanks, Paul). 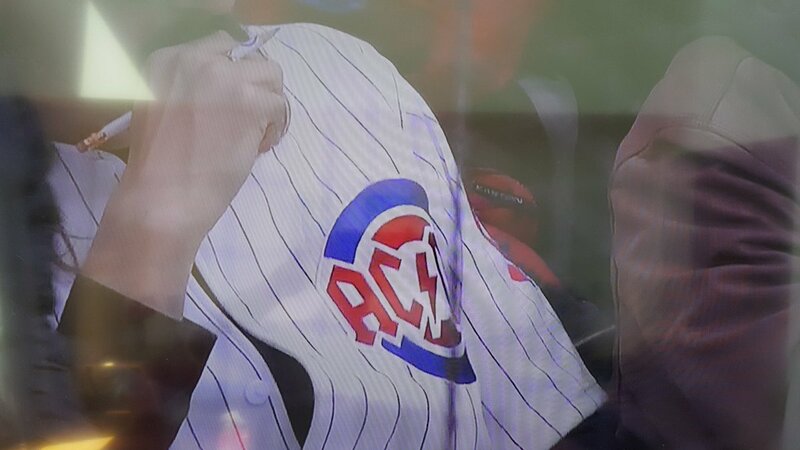 … A fan at yesterday’s Cubs game had an AC/DC inspired jersey (from Griffin Smith). Here’s a slightly larger view (from Matthew Gibson). 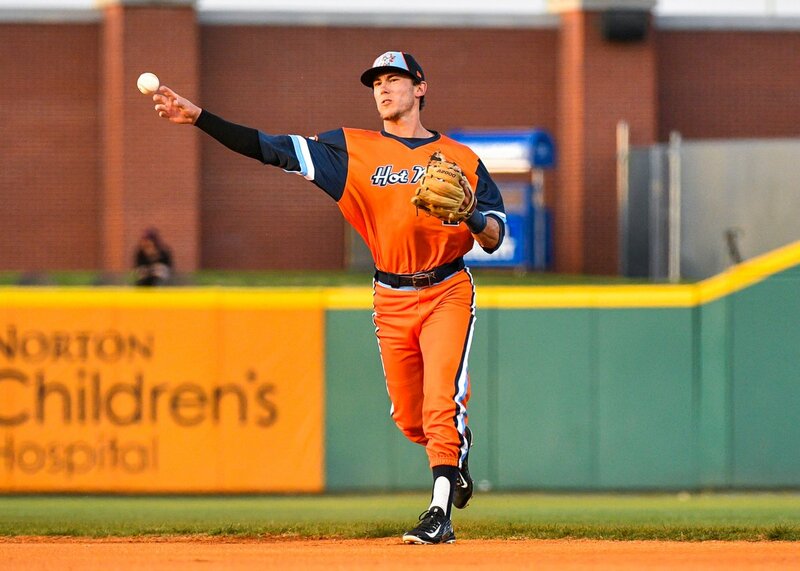 … Here is the whole Bowling Green Hot Rods throwback uniform in action. Inspired by the 70’s vibe (awesome spot by Eric Leach). … Today is, of course, the 70th Anniversary of the day Jackie Robinson broke the modern day color barrier in the bigs. So naturally there will be lots of special cleats today (h/t Maximiliano). … Yesterday marked the first time in major league history when three players with the same last name all started in the outfield — the Alous did it, but they did not all start (from Robert Hayes). They’re all named Garcia (h/t Mike Chamernik). … The great Todd Radom has a nice piece in The New York Times entitled, “Why I Love Ugly Uniforms,” a must-read! Todd’s sentiments perfectly characterize why a great number of us born in the mid-sixties fancy those completely garish 70’s polyester uniforms. Terrific job, Todd! 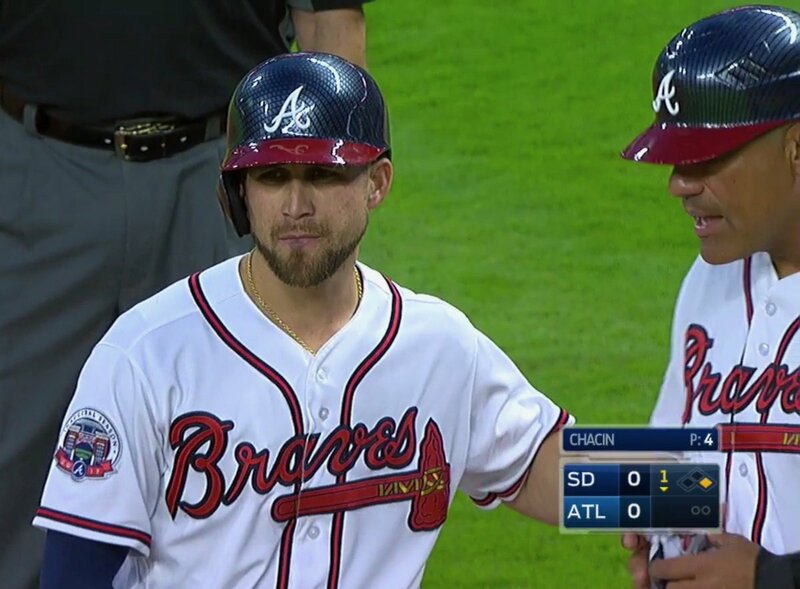 … The Braves broke out their special carbon fiber helmets last night. As Paul noted during the week, they’ll only be worn twice: last evening and Sunday (from LRC). Here’s another screen shot (from Paul), showing the coaches also wearing the lids. Batboys too (from Tony Andela). 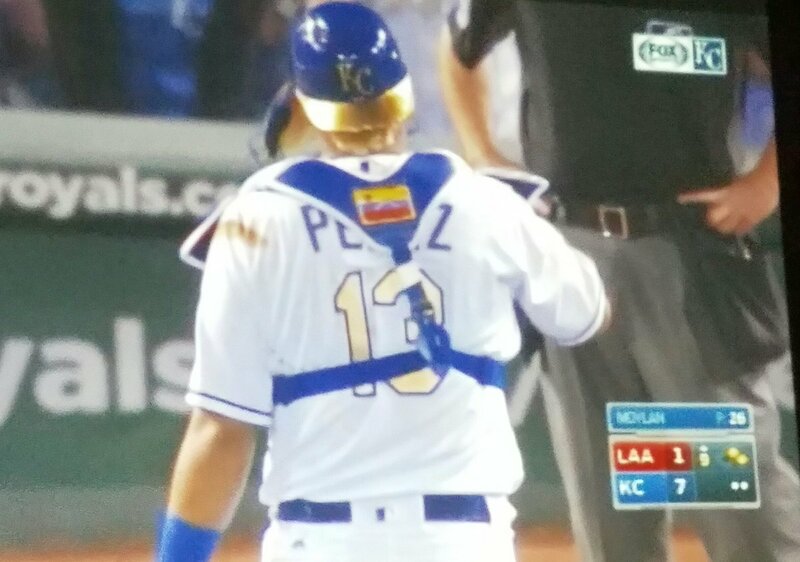 … The Royals Sal Perez is wearing a blue helmet with gold visor to match the Royals gold-trimmed unis (from Zach Brady). Here’s an even better look (from Tyson Billings. … Some Stance socks look good. Others are just garish. 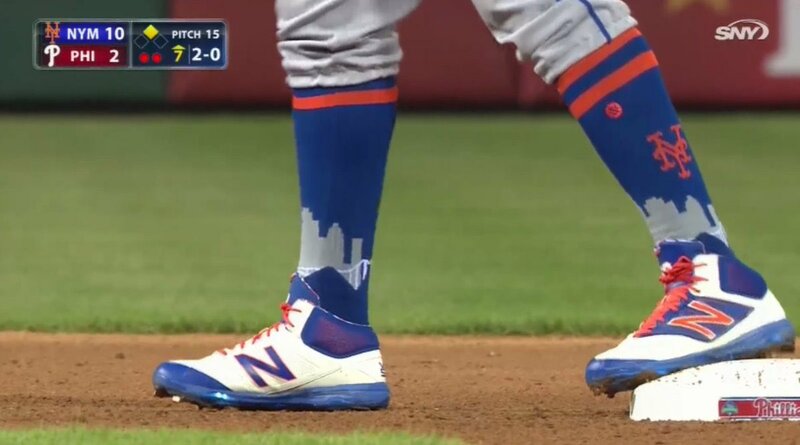 I’m kinda on the fence with these Mets socks (worn last evening by Jose Reyes and Yoenis CÃ©spedes, although that shot is from a different game). Screen grab by Susan Mills. 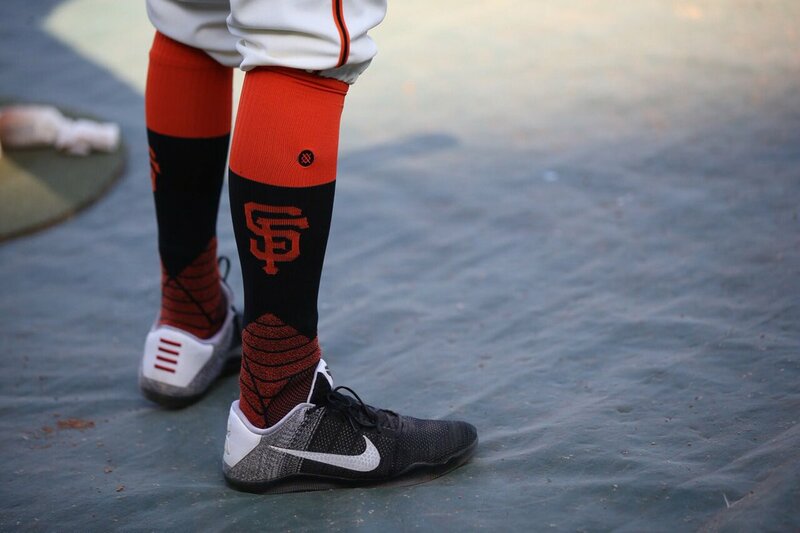 … Speaking of garish Stance socks, here’s Hunter Pence wearing Giants socks (via Joe Farris). 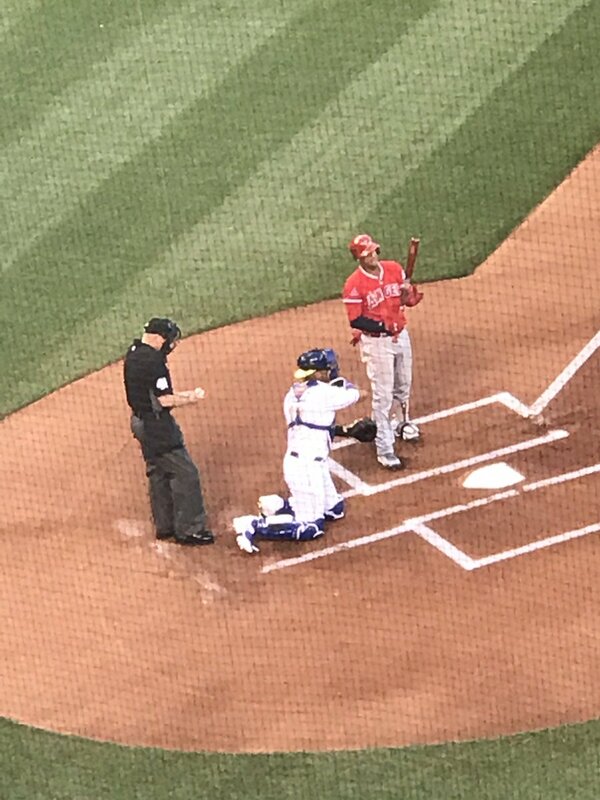 … Even worse than the garish socks are the faux stirrup socks that Stance is giving the Dodgers as an option (screen shot via Austin Donley). Judging from the comments, people are starting to sour on Stance. … There are few things Rob Manfred has done as commish that I agree with, but when he’s right, he’s right and I’ll tip my cap to him (h/t Dom Cooper). … According to Jackson White, here’s “An all-time random Chief Wahoo appearance, Barry Gibb in music video for Bee Gees tune “Alone” (circa 1997).” … As the Braves new park debuted last evening the team went with the current style of numbers for retired numbers for everyone instead of the style they actually wore (from Matthew). … Speaking of retired numbers, Todd Walker had his LSU Jersey retired last night. 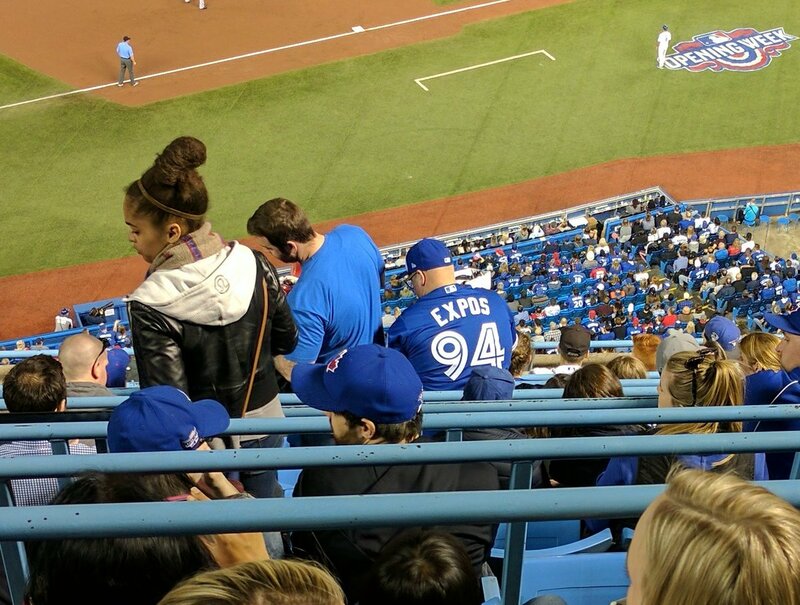 … Some guy at last night’s Blue Jays game was wearing a jersey of the 1994 World Champions (h/t Jaden Daly). 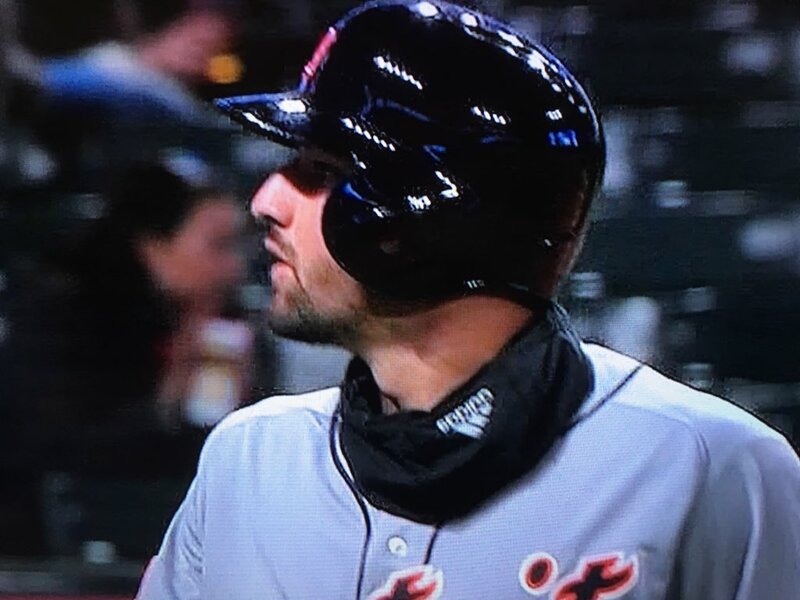 … The Orioles wore their batting practice caps during last night’s game against the Blue Jays. Submitter Will Shoken notes, they typically wear the O’s cap on Friday nights when they wear their black jerseys. 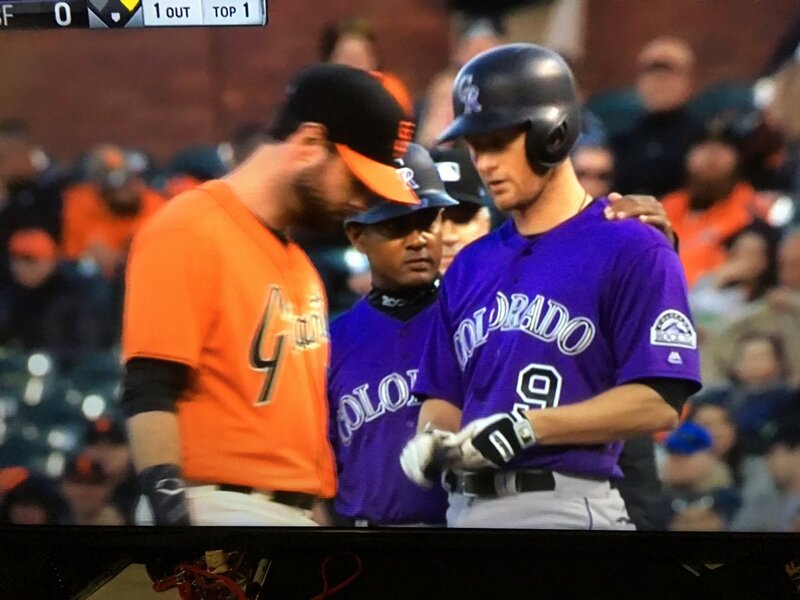 … The Giants and Rockies played an actually attractive color vs. color game (especially nice if you happen to be a Clemson fan). From Dru. 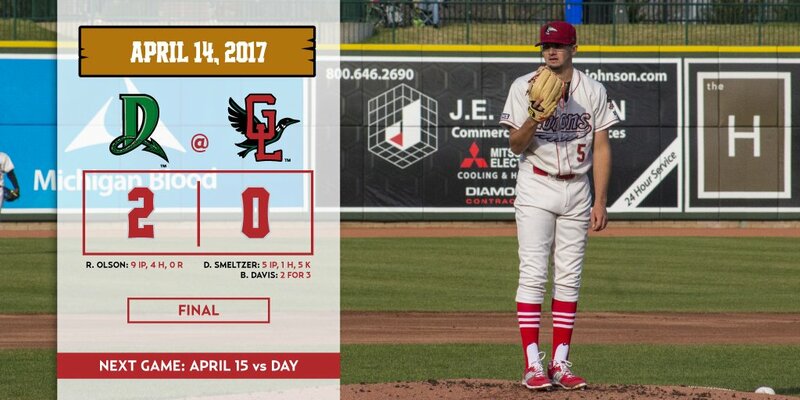 … The Great Lakes Loons have a strong stirrup game (from Gabe Ramirez). 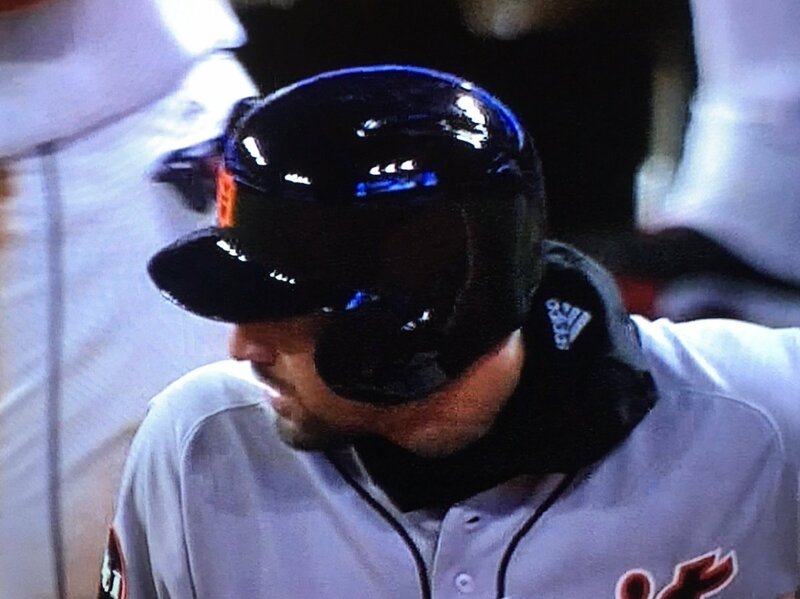 … Weird one last night: It looked like the Tigers Nicholas Casellanos was wearing an adidas hoodie, but Dan Kennedy doesn’t think a hoodie would do this. According to Steve, it’s “an Adidas fleece neck warmer. Popular in soccer training and I’ve seen it catch on in baseball.” … New alternate jerseys for the Beloit Snappers (from Zach Loesl). NFL/College/Football News: [Insert Eyeroll Emoji Here] Lost in all the hullabaloo over the Lions new uniform unveiling is the fact that these new unis will make them bigger, faster, stronger “utilize some of the most advanced technology available when it comes to enhancing player performance on the field, including a full range of motion, lightweight performance and superior ventilation.” [Excuse me while I rinse my mouth.] It’s just another way of saying the unis are the new(er) Nike Vapor Untouchable design, which also means they don’t have the flywire collar design we all love so much. … More on the Lions, from Thomas Juettner: “I’m a little confused by the Lions new socks, especially on the home set. Some images show them with traditional whites while others show them with no whites at all. Also, the promotional images says ‘solid Honolulu blue socks’.” He continues, “The Lions have always worn solid socks with their throwbacks and the color rush uniforms brought in the idea of solid, no-white socks to the league as a whole. Could this be a sign of the league dropping the mandate on whites? If so, I’m all for it. Especially if it encourages some teams to wear solid white socks with their dark pants rather than go leotard.” … Perhaps unsurprisingly, the Packers’ Ha Ha Clinton-Dix is unimpressed with the Lions new unis. … The Utah Utes play their annual Red-White spring game today, and here’s what the teams will wear. … Here’s a video from UT(exas) showing their helmet being decaled. From Matt Gallegos, who adds, “Back to the original Steer color?” … For their spring game, Pitt Football will wear Script Pitt helmets with a Steelers logo on the right side “to pay our respects to a great man, Mr. Dan Rooney.” (from David Alan). … There is a Clemson Tigers National Champions coloring book (from James Gilbert). … The NFL will release the 2017 schedule next Thursday, at which time the Lions will announce when they’ll wear their new unis — it’s a safe bet they’ll wear the throwback on Thanksgiving. … With the Lions new unis now revealed, this article ranks all the new uniforms since Nike too over the NFL apparel contract — with the exception of the first (best) team on the list. With the exception of the Lions (ranked #3) and the Browns (ranked #6), I think the rankings are pretty spot on. I’d move the Jags (last) up two spots, ahead of Browns and Bucs, and put the Lions below the Vikes and Dolphins. All subjective of course, but this is one ranking set I pretty much agree with. Hockey News: Yesterday’s ticker included a link about what football jerseys would look like of hockey teams, and Phil DeBoo noticed there are only 29 teams represented — they are missing the Phoenix Coyotes. 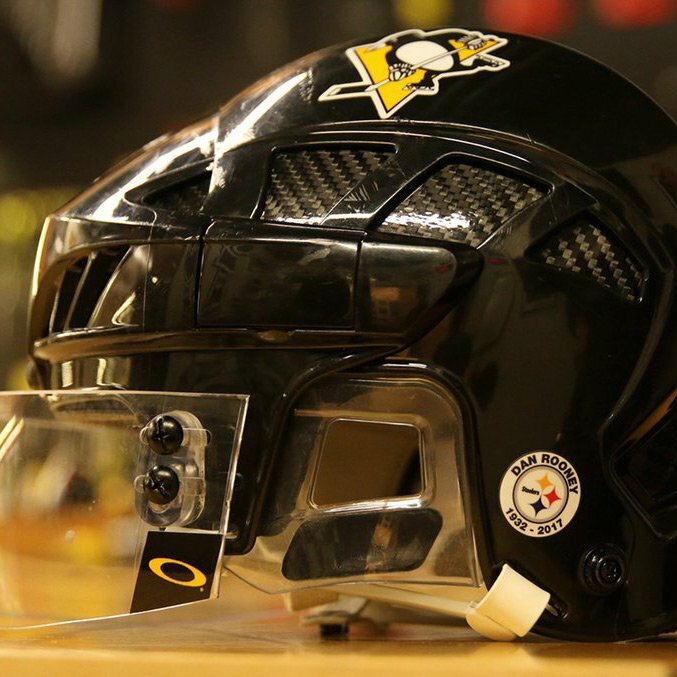 … Several folks sent this in: The Pittsburgh Penguins will honor the Pittsburgh Steelers late Chairman, Dan Rooney, with a special tribute on their helmets. 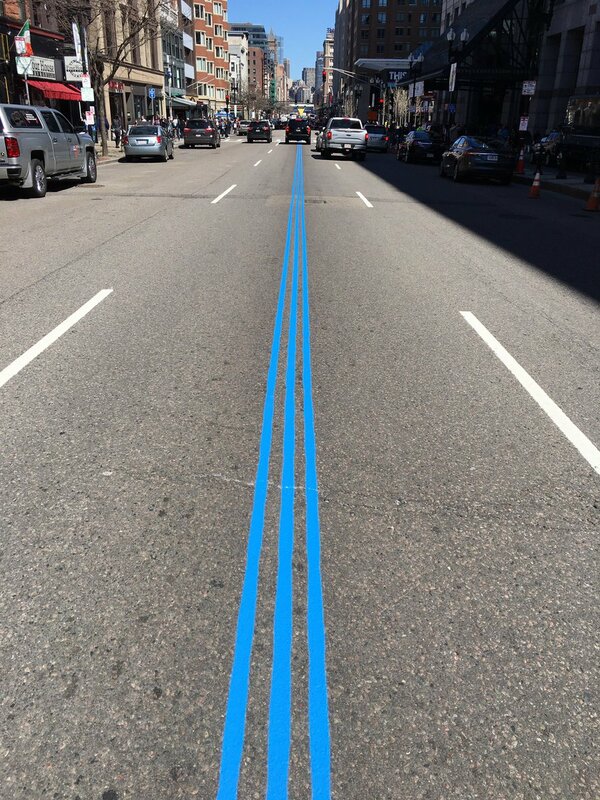 … Here’s a bit more on that. NBA News: Do you know why Steph Curry wants extra squeak in his shoes? Well, now you do (from Jeff Eisenband). … “Any day you find an ostensibly game-used 1974-75 Cincy Powell Squires jersey for $4 @ the thrift is a good day,” writes Darrell Dawson. … It’s about that time. Here’s our pal Conrad Burry‘s initial 2017 NBA Playoffs court bracket. Conrad will update it after each round. … The Milwaukee Bucks have announced a Game Three “Blackout” (from Zach Loesl). … The Golden State Warriors will be moving to a new home in San Francisco in 2019, but they will not be “renaming” themselves the San Francisco Warriors (thanks, Paul). … Here’s the full, color-corrected (thanks to Donovan Moore) view of all four official new Minnesota Timberwolves logos (from Conrad Burry). Soccer News: “Stumbled upon this,” says reader Greg Kissler. Renderings of soccer uniforms if they had been designed by local fashion brands. I must say, some of these are quite well done (and also might look a LOT better than current kits being designed by Nike and adidas). 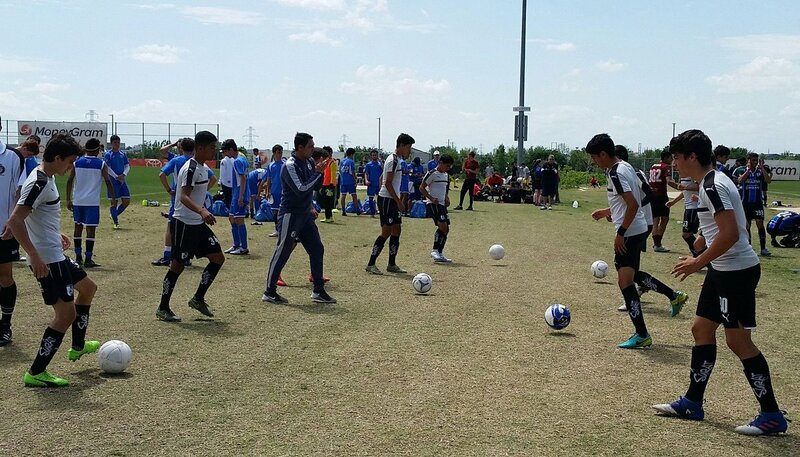 … Here’s a look at the Queretaro U17s warming up. All jersey numbers in the 300s (from Trillvio Dante”). … The US Soccer The Development Academy program provides education, resources, and support to impact everyday club environments in order to develop world-class players. Yesterday they tweeted “Best wishes to our Girls’ DA member clubs ahead of the @NWSL’s 5th season!” (from James Gilbert). And that’s it for today. Thanks to John Pulsinelle for today’s well-researched lede, and keep those “Perfect Baseball Card” submissions coming (my e-mail is linked above). Make sure to come back tomorrow (I realize it may be hectic day for some, with it being Easter Sunday), because I should have a VERY SPECIAL RAFFLE you guys will surely like, and I’ll also be taking suggestions for the next uniform contest (which ties in with the raffle). The Lions throwbacks are circa 1935, not 1932. 1932 would be Portsmouth Spartans purple and gold! Also, the Coyotes are represented – they’re the second team shown, because they’re the Arizona Coyotes now. 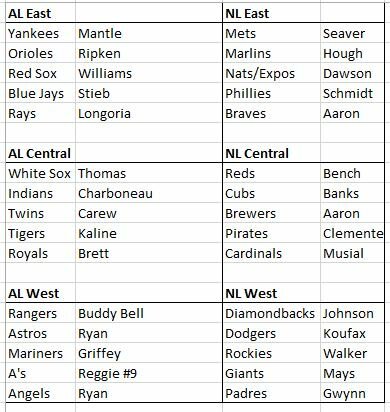 All 30 current teams are represented. You were right. It’s not a hoodie. It’s a snood – we would call them a neck warmer. Premier League / FIFA banned them a few years ago but it before they became very popular with warm weather players. I also am in possession of physical logosheets for Baltimore, St. Louis, and earlier iterations of the Jaguars and Panthers. Will try to either scan or take photos later. Today’s column has its own apostrophe catastrophe. Should read “Alous” instead of what’s currently written. Those Manatees uniforms are part of a “CFL Alternate Universe” thread on the “Concepts” board. Not official in any way. Do the Cleveland Browns count? I guess, technically, they do “take the field.” But that’s about where the participation ends. And their current jerseys are worse than most of the expansion team prototypes. That St. Louis Stallions horse logo was embarrassingly bad, not professional looking at all, like something a kid drew to kill time instead of paying attention in class. The color scheme also doesn’t work. Purple & gold doesn’t work as a color scheme? Since when? I’m Minneapolis born and bred, and love it for the Vikes. However the shades in this specific case of the St. Louis Stallions don’t work. Done differently, it could have. 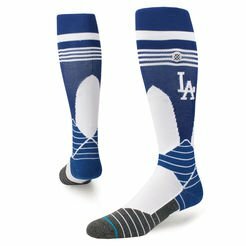 In response to the comment about some lions wearing white socks and blue, I am pretty sure every team uses two pairs of socks, one that matches with the colors (top sock) and the other being plain white. Now a days I’m even seeing some teams, mostly while wearing white jerseys, wear white compression pants instead of the bigger socks (Aquib talib) because they’re more comfortable. And here I was thinking Seattle’s “toasted grasshopper” was some kind of mixed drink – imagine my surprise when I clicked the link! Kudos for this very well researched piece and thank you for sharing. That was entirely new to me, very well done, and the best thing I will read on Uni-watch in 2017. Thank you for your kind words; much appreciated! I’m currently working on a supplement article to include some of the suggested teams, and league I missed. The ludicrous Manatees nickname also received the most votes in a fan contest to name the Florida Marlins. So as silly as “Marlins” is, it could have been Manatees. Why is it ludicrous? It’s fun and region-appropriate. Better than dozens of iterations of fierce birds and big cats. As Mike Nessen noted on Twitter, all the Braves with retired numbers wore the red block letters displayed. Aaron and Niekro wore different styles in the 70’s, but wore the red block letters in the 60’s. There’s a photo of all the numbers on the stadium faÃ§ade, and I didn’t think I saw Jackie Robinson’s number 42 among them. Though the number remains retired, I can’t think of another MLB stadium that doesn’t display Jackie’s number. Perhaps the 42 is exhibited somewhere else. AKA the best uniforms the Lions have ever worn. Here are a few other named pro football teams that were “vaporware”. International Football League – A proposed “NFL Europe” that had plans to kickoff in the spring of 1975. The following team names were announced: Barcelona Almogovares, Istanbul Conquerors, Munich Lions, Rome Gladiators, Vienna Lipizzaners, and West Berlin Bears. Florida Suns – A proposed NFL expansion team in the 1970s that was going to play their games in Jacksonville and Orlando. Memphis Kings – An all-black ownership group that was seeking an NFL expansion team in 1971. In honor of MLK the proposed team was named the Kings. Spirit of Miami – The failed relocation of the USFL’s Washington Federals. Before they folded they had already hired Howard Schnellenberger. Arizona Suns – Phoenix’s NFL expansion bid in the 1980s that was being led by Bart Starr. Correction – Arizona’s NFL expansion team wasn’t going to be called the Suns. They were to be named the Firebirds. I mistakenly listed their name as the Suns. Obviously there would have been some sort of trademark battle if they had decided to adopt the same name as the city’s NBA team. The Bombers name and uniforms like the stolen logos of the first Ravens prove the NFL hates Baltimore. At least Irsay and Tagliabue will be together in the afterlife with their Deadskin buddies looking in vain for a cold one.